What do them carrots - er, karats - mean? In our last post we touched on the value of gold and how it was historically considered the dominion of royalty, and for those who were considered the wealthy, the upper class, the rulers and merchant princes and robber barons. It was hard to find, took much effort and many resources to dig out of the ground, and was difficult to process into the pure metal that was so coveted. While used for early commerce in the form of coins, they were not common and most certainly not in the possession of the common people. And then … along comes the Industrial Revolution. Suddenly the extraction of gold was much easier, making gold much more plentiful and readily available. With the increase in supply gold marketers saw an opportunity to meet a demand that had gone unfulfilled for centuries, even millennia: bringing gold to the masses. And, joy of joys, make more money! The old way of mining and refining gave way to the new during the Industrial Revolution. But pure gold was - and is - still expensive. So those who sold gold discovered they could make their gold go further by “diluting” it, or mixing it with other metals to make it go farther. Gold can be mixed with silver, zinc, or nickel, each of which is much cheaper than gold. This practice not only had the effect of extending the gold supply, but it also had the effect of lowering the price, making it cheaper. And as the price went down, it appealed to and was accessible by a much larger pool of customers. Instead of selling 1 kilogram of gold to a small number of wealthy customers they could sell 3 kilograms of gold to the wealthy AND to many, many more who were not wealthy. They also learned that adding different metals to the mix could change the color of the finished alloy. For example, rose gold has a higher content of copper, while white gold may have a higher concentration of silver or palladium. But now there were different purities of gold that were in circulation. How to tell what was pure, and what was not? Some still wanted their gold to be pure, and it was, but how could it be easily identified to both those who were buying and those who were admiring? To identify the different levels of purity, a system was developed called “fineness”. The fineness levels are indicated with a number, which is followed by a K (in the U.S.). The ‘K’ stands for karat (not to be confused with the Carat used to measure diamonds!). The karat is defined as a level of 41.666 fineness, out of 1000. So when 1000 is divided by 41.666, we get 24. So 24 karats equals a fineness of 1000 (or, more accurately, 999.9), which is pure, with no other metals other than trace amounts of other elements mixed in. So if we had a 1K, or 1 karat, gold thingy, it would be 4.166% gold and 95.834% other metals, and a 9 karat thingy would be 37.5% gold and 62.5% other metals. This brings us to how purity is used in the gold we buy. The most common purities or fineness of gold sold in the U.S. are 10K, 14K, 18K, and the less-common 22K. 24K - Pure gold, baby! This is 99.9% pure, with no other metals mixed in (other than trace elements left from the refining process). This is typically not used in ordinary, every-day jewelry. It is too soft and will bend out of shape and picks up scratches very easily, so making something that is going to be worn in one’s day-to-day activity would be ill-advised. Most of the items held by the average buyer that are composed of 24K gold are coins, bars, and other investment-grade items that won’t be handled or worn much. 22K - Very high content of gold, 91.67%. This is the softest type of mixed-metal jewelry. The 8% content of other metal doesn’t sound like much, but it does make the jewelry much firmer. However, it is still very soft and will bend, break, and scuff or scratch fairly easily, so it is not used for daily-wear jewelry. 18K - 75% pure. This purity or fineness still has a very deep gold hue. It is still gentle on more sensitive skin, similar to the higher purities of 22K and 24K. However, because of its high gold content, it still scratches easily and would not be advisable for someone who is very active. 14K - 58.5% pure, and the most popular choice in the U.S. This is still mostly gold, but is much harder and more durable than higher purity gold jewelry. It doesn’t have the deep, yellow luster of the 18K, 22K, or 24K, but still looks like gold. It is a good choice for those who are more active or will be wearing their jewelry day in and day out. This is the best balance of price, durability, quality and purity, and appearance. 10K - 41.7% gold. Obviously, this is the least pure of the group and is, in fact, less gold than it is other metals. Because it is more other metals, it does not have quite the same appearance or luster that the higher purities lie the 18K or 22K do. Also, if a wearer has sensitive skin the other metals can irritate. On the plus side, it is the most affordable, making it available to a much larger customer base. What's with that yellow metal, and why do we like it so much? What is gold, and why do we like it so much? What is the difference between a gun sight and a scope? Open sights! Aperture sight! Peep sight! 5-12x42! Fiber optics! Tritium! Variable scope! Night scopes! What are all these things, how do they work, and when would I want to use what? Some are confused by the difference between a sight and a scope, as well as the different types of each. We’ll do a quick rundown of the different kinds of sights and scopes and their primary purposes, as well as when one may want to change from one to another. Also called “iron sights'“, open sights are the most basic. They are what we see on all guns before any modifications are done. There is typically a single front post at the end of the barrel, appropriately named the front sight. The rear sights have a double-sight configuration with a gap between them. Aiming is achieved by viewing the front sight through the gap in the rear sight. Actually, this is the method of aiming for most sights we’ll be exploring below. Open sights are the most basic of the sight group and come standard on pistols, rifles, and shotguns. Some may have distinct designs to differentiate them from others (Glock sights illustrated below), but their function is the same. These are best suited for situations where there is plenty of light, whether outdoors or at an indoor range. Also known as a peep sight, the aperture sight is similar to the open (iron) sight, but only in the front. While it uses an open front sight, the rear sight is a ring or circular opening to ‘peep’ through while aiming. The concept is that the eye will more easily align the front sight when looking through the rear aperture. 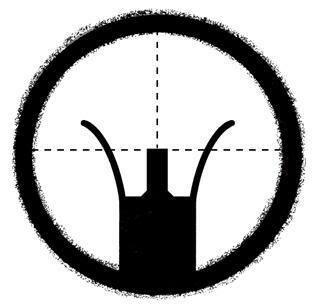 This type of sight is used mostly on rifles. The standard issue M16A2 that I used while serving in the United States Army was equipped with a peep sight. These are also well-suited for daylight use, or in other situations where the light is sufficient for the unaided eye to see clearly. There are many other types of sights that are available to upgrade your gun if so desired. One of the most common is an upgrade to a fiber optic, or FO, sights. 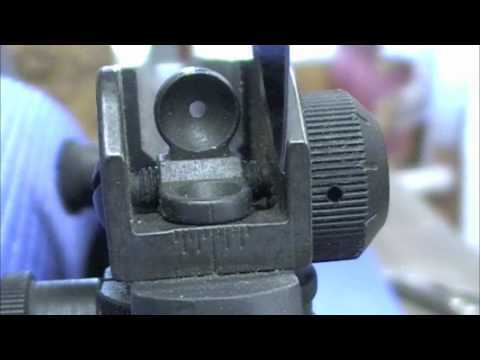 Aligning a FO sight is not too different from lining up iron sights or aperture sights: the fron sight is viewed through the rear sight. The difference is in the material the sights are made of. While still being open, and even based on iron (or other composite material), FO sights contain short pieces of optical fiber for the dots. These fibers gather the ambient light around them and focus them toward the shooters eye, making it easier to align the sights even in dimmer light environments. Fiber sights don’t work light night sights, though. They require existing light to gather and focus. Tritium is a substance used in open sights to allow alignment even in the dark. Tritium has been used in various household items, including wrist watches, to illuminate in the dark. Again, as with iron sights, the front sight is aligned through the rear sight. The only difference is these can be seen in the dark and are designed to be used in low- or very-low-light conditions. First, we’ll go over what all scopes have in common. Scopes are separate devices that are mounted onto a firearm. They use lenses to magnify the view of the shooter, just like a telescope, a microscope, or a magnifying glass. They give the shooter a sharper view and increased ability to see and aim at a distant target. Scopes are measured in magnification levels and lens diameter. A scope that is designated 5-12x42 will magnify the image seen through it from 5-times to 12-times the normal size. The 42 designates the diameter of the objective - or front - lens, which gathers light and focuses to the rear - ocular - lens. There are also scopes that don’t ‘zoom’ as the example above but are fixed with only a single magnification. And finally, the most fun of all! Night vision scopes provide just that — the ability to see at night. Where the fiber and tritium sights give the shooter a view of where the sights are, night vision truly allows the shooter to see not just the scope but the environment being viewed through the scope. 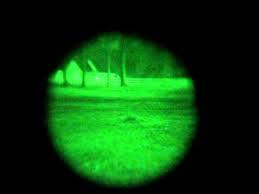 Without getting too technical, there are two types of night vision technology: Image Enhancement and Thermal Imaging. Image enhancement captures light and amplifies it while thermal imaging captures the heat signatures and presents them to the viewer. There’s a more detailed article here. A popular use for these is for varmint hunting, or rifles used to hunt down varmints such as coyotes, rats, or other critters that damage crops, livestock, or other property. Because they are mostly nocturnal creatures the night is the most favorable time to clear them from the property. A view through a night-vision scope. This is, of course, a very basic, high-level view of sights and scopes — and we haven’t even begun a discussion on holographic or reflex sights! There are as many flavors and combinations of flavors as there are shooters, as well as after-market manufacturers and marketers that offer anything and everything you could ever want. Don’t like what you have? Pop ‘em off and get something new. Don’t like them either? There’s a sight for that! Why are some diamonds so much more expensive than others?